Originating high in the Tibetan Plateau, the Mekong River is the life-blood of activity throughout the history of southeast Asia. Locally known as the Mae Nam Khong, the literal translation is Mother of Water River. 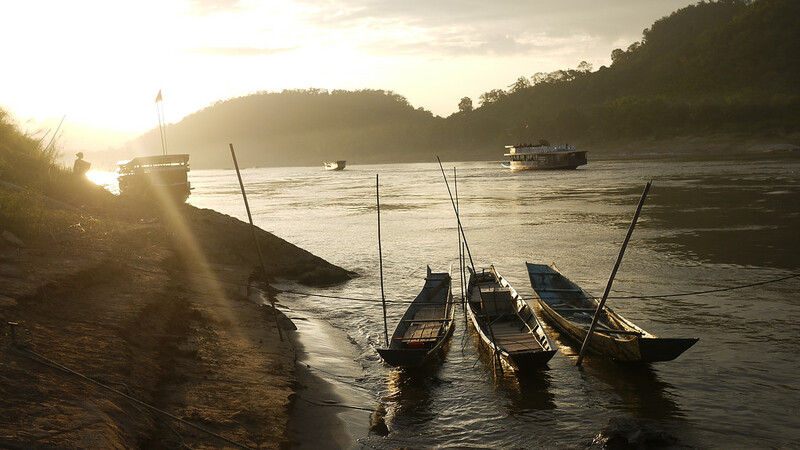 The river runs through China, Thailand, Laos, Cambodia, and Vietnam, and over the centuries consistently remained an important focal point for locals, governments, and foreign countries. Locals use the River to sustain life — food, transportation and local trade. Boats are already docked in the gently swaying waters by the time the sun is setting. The boat workers must have left to find dinner because the banks of the Mekong River in Luang Prabang were nearly empty this time of day! 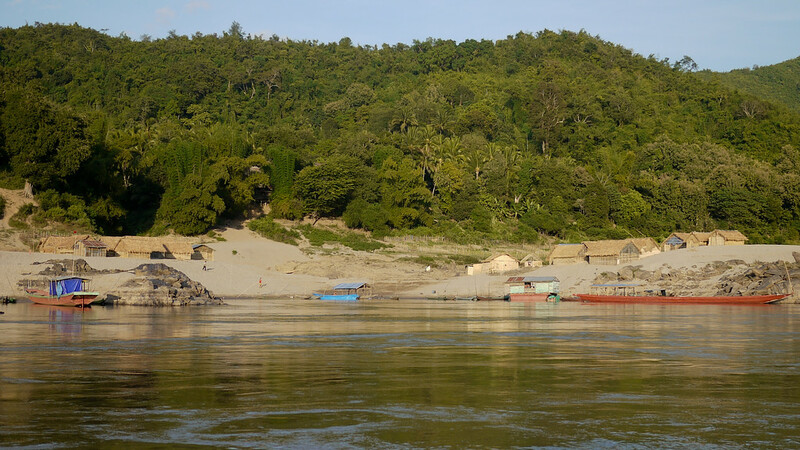 Governments dam and re-route the river in political power struggles between the nations sharing the Mekong River’s natural resources, and international political struggles have relied on the power of the Mekong to push goods out to foreign ports for profit and trade. There’s a lot to this powerful river and it’s with good reason the the poetic and alliterative description the Mighty Mekong fits so well. Over the past several years, I’ve seen various parts of the Mekong River–within Thailand, Laos, and Cambodia to be exact, and below you’ll find a slice of that life I witnessed as locals use the river waters and mineral-rich banks to sustain their lives and livelihoods. Just before sunset in Luang Prabang, Laos, young monks c00l off from the afternoon heat in the river waters where the Nam Khan and Mekong intersect; their giggles and shouts echoed out over the nearby river banks. 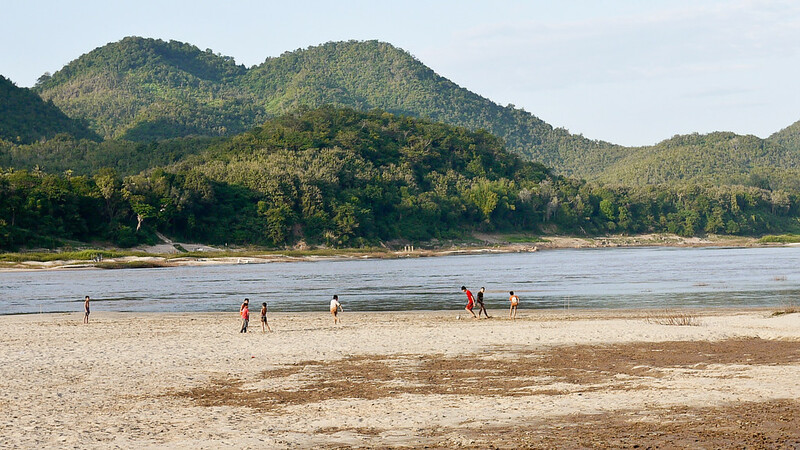 These children swam to a sandy island in the middle of the river for a lively game of kick ball. When the other team really got a good kick in, the losers had to dive into the river to retrieve their ball! Luang Prabang, Laos. 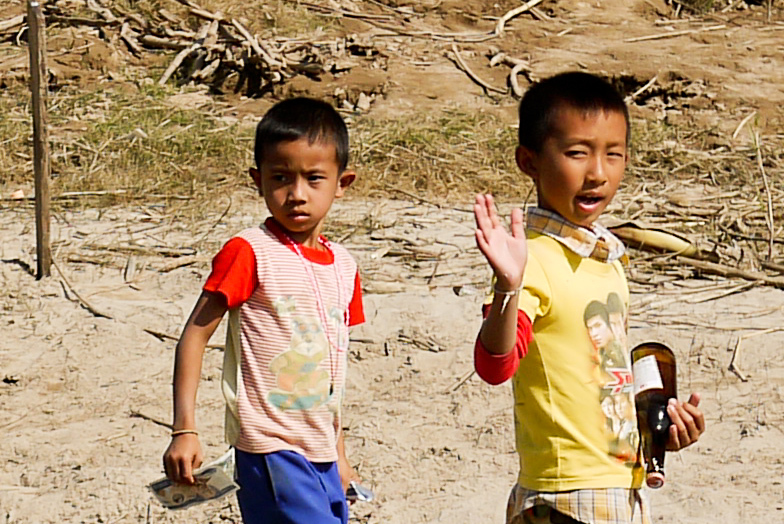 A young boy was excited to see me so far from town as my niece and I walked the banks of the Mekong River near Luang Prabang, Laos. Clearly he was familiar with the camera though and hammed it up with different poses! 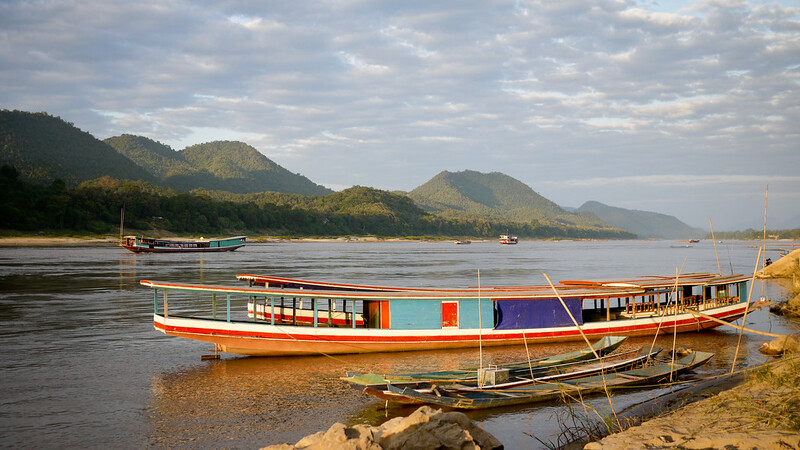 The iconic wooden slow boats dot the Mekong River all day long as tourists come and go, and locals transport their goods from one town to another. 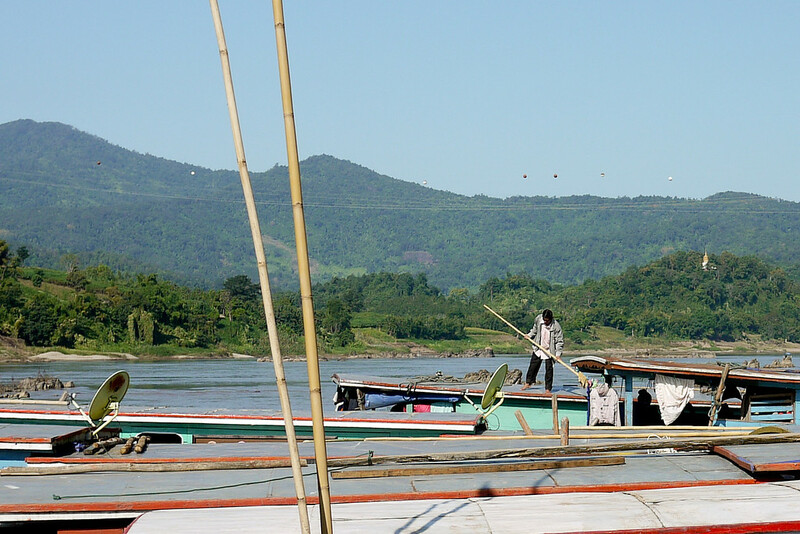 Locals use the small uncovered boats for fishing and quick trips across the river. Satellite dishes adorn traditional wooden slow boats (which are also used as houses for some Laotians) in an odd display of modernity as a man extricates his boat from the docks in Houay Xai, a border town with Thailand. 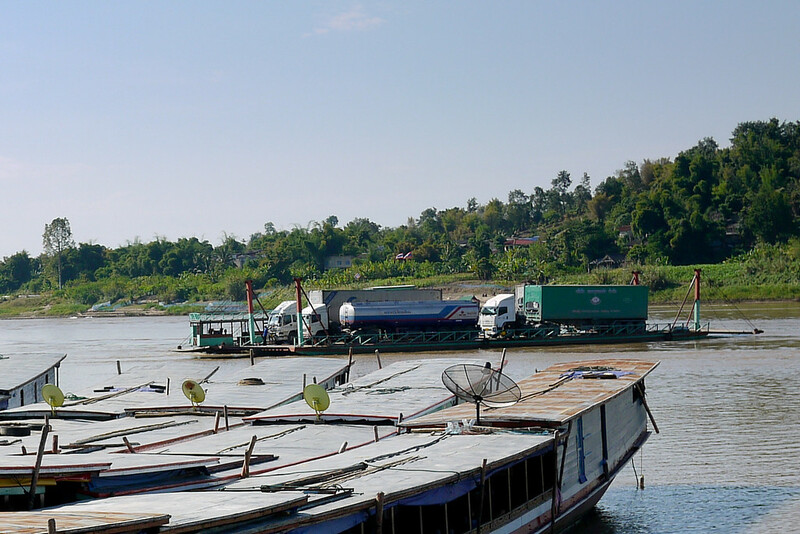 Several huge semi trucks wait to cross over the Mekong River from Thailand into Laos at the border crossing between Chiang Khong and Houay Xai, the border towns on each side of the Mekong. 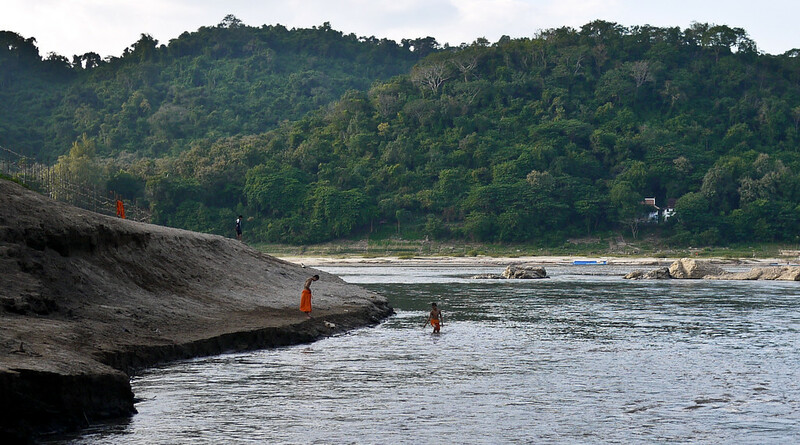 Our captain carefully guides the slow boat down the Mekong River, watching to avoid the huge rocks and swift current in some areas as we make down river from Pak Beng to Luang Prabang, Laos. 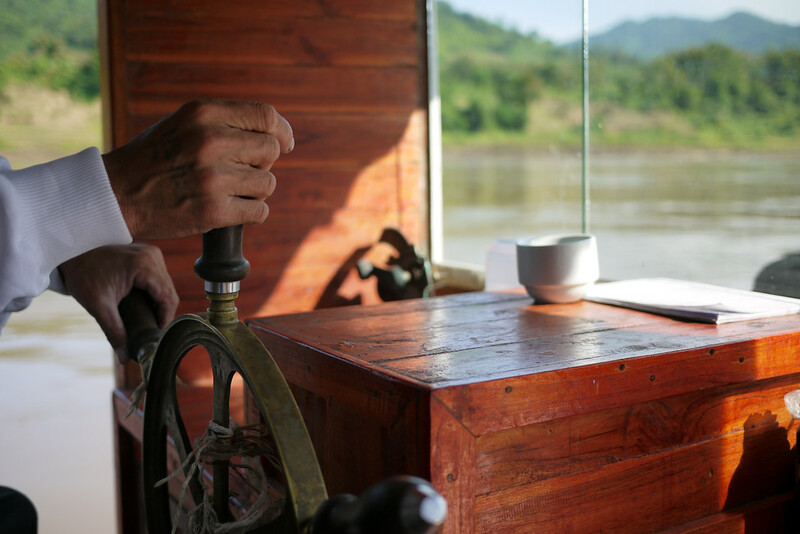 The slow boat occasionally stopped at small smatterings of wooden and bamboo huts lining the Mekong. Young boys board our slow boat at the tiny towns and sell snacks and cold drinks to the tourists on board. They come on for just two or three minutes and swarm the boat to make sure they hit every possible sale. 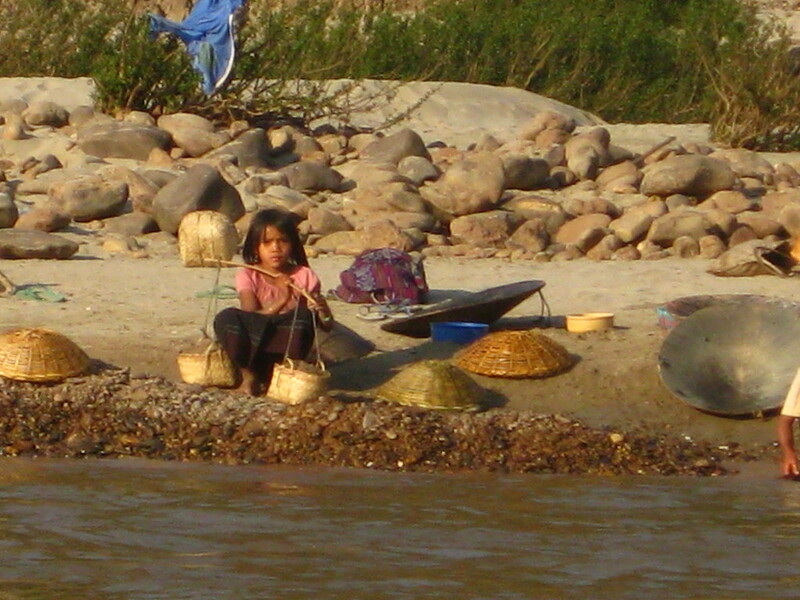 A little girl with hand-woven baskets looks at me quizzically as I slowly float by her home while she prepares dinner on the banks of the Mekong River. Ana plays with the light from the setting sun on Mount Phousi in Luang Prabang, Laos. Did you take anti-malarials for your boat trip? I have in my plans to take a slow boat down the Mekong from the Thai border. Taking anti-malarials for my trip is my biggest concern. I do not want to take them if the risk is low. I also found a Thai site that pretty much said not to take them for the majority of the places I will be traveling. I figured I wouldn’t need them in Bangkok but the CDC seems to suggest them for Chaing Mai and Chaing Rai as well as the border areas along Myanmar, Laos, and Cambodia. Good question, and the simple answer is no, I have never taken anti-malarials in Southeast Asia. And I have to caveat all of this with “I am not a doctor, please see a professional as well” — but in general the reason I have never taken it comes down to the seasons. I’ve always traveled in the dry season or the very beginning of rainy season, and the risk for malaria and dengue are lower. I do know one person who got dengue in like December, but it’s just not as common. If I were traveling at the end of rainy season (Sept & October), I would perhaps consider it. Few backpackers I meet take it period, and almost none tend to take it during dry/cooler season. Many backpackers instead use Deet repellant and are particularly vigilant at dusk and times of day when mosquitos are really active. You would need to do this even on anti-malarials because of the risk of dengue fever. A wonderful post, I love all the images. Your blog is great. I love hearing of others travel adventures. Thank you Maggie! The country was so beautiful it was easy to photograph. :) Good luck on your own adventures in retirement! Nice photographs. It gives me an idea where to go next. :) Thank you for the lovely photos. Love these photographs. Having just been to the Mekong in the Golden Triangle region in December these photos are very meaningful. Thanks for sharing! Now THAT is what I call a photo essay! Full of stories, great images! Good job! 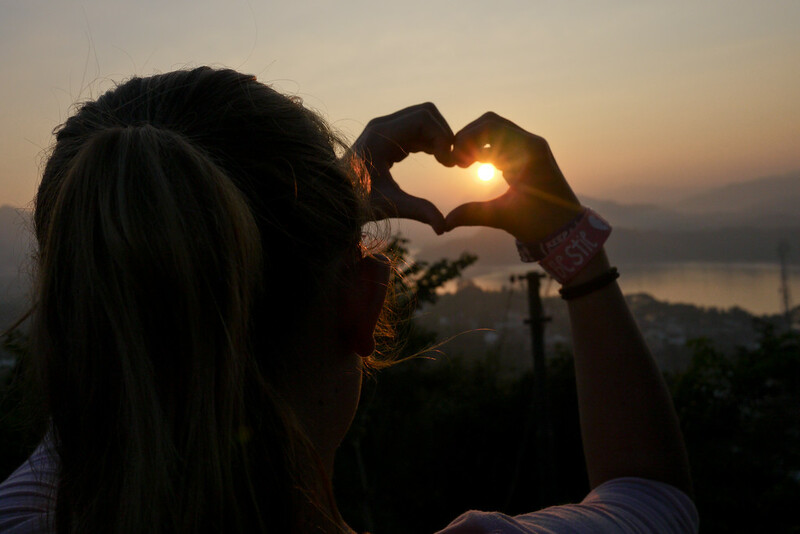 These photos are lovely but they make me miss Laos SO much! These are lovely shots Shannon. I love the diversity in your selection. My favorite is of the child excited to see you in the water. I would say just fantabulous thoughtful post… just Woowww…!!! What you and your niece are doing is so inspiring, what an awesome childhood you are helping to give her! Love your blog, keep up the great work! Beautiful series of images showing us glimpses of life different than mine. Love the wooden slowboat photo. Takes one to another place and time. Gorgeous pictures! In a few weeks, I am going to be leaving Vietnam to go into Cambodia and Laos. This was a great taste of what’s to come. I have been to Luang Prabang and loved it. I really enjoyed seeing glimpses of your trip down on the slow boat, as that was something I wanted to do but couldn’t pull it off in the time I had, although I did get to go to Pak Ou caves. I am glad you changed your mind about them by the way! You’re incredible, thank you for sharing this with us! That last shot is just incredible! I loved the entire photographic narrative. What a special place in the world!!! These photos are absolutely beautiful. I love the one of the wooden boat with the mountains in the background!